I’ve just returned from this year’s TCEA Annual Conference in Austin, Texas. This year I had the chance to share some of my favorite ways to use creation tools and scannable technology in the classroom. I met with a handful of companies who are excited about their new products and recent updates, and had the chance to catch up with some passionate educators from all across the country! This year I presented on the Adobe Spark creation tools – Page, Video, and Post. These are three of my favorite tools for teaching and learning since they are free and work on iPads, iPhones, Chromebooks, and the web-browser on your computer. Although I often share this tool during full day workshops when I visit schools, it was lots of fun to see what attendees were able to create during our short time together. We discussed how students can create video book trailers with Spark Video and how teachers are using Spark Page to create websites for their classes. We also talked about sharing student creations using QR codes and augmented reality – something I feature in my book on #ScannableTech. After trying out Facebook Live for FETC highlights I was excited to talk with Audrey O’Clair at the Soundtrap booth at TCEA. We quickly shared some of our favorite things from the conference. I’m really excited about the way live video can be used to capture these type of moments. Check out the video here. One of the neat things about going to a conference is connecting with folks you’ve only met via email. At TCEA this year I had a chance to talk with the Founder and CEO of Bloomz, Chaks Appalabattula. It was so nice to hear firsthand some of the exciting things happening with this parent engagement tool. You can check out some of my posts featuring Bloomz here. The team at Corwin hosted a dinner for Texas teachers where I met with educators from a local district. It was so much fun sharing my book Deeper Learning with QR Codes and Augmented Reality: A Scannable Solution for Your Classroomwith local teachers. If you haven’t tried out QR codes or augmented reality with your students it’s a fantastic way to share student creations. One of my last trips to Austin was for iPadpalooza last June. I was glad that I had the chance to catch up with some of the team behind this awesome event. If you haven’t heard of iPadpalooza you can learn more here. I highly recommend adding it to your 2017 calendar. 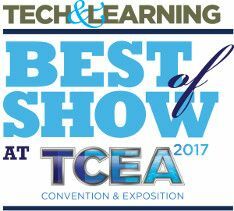 Did you attend TCEA this year? Share your highlights below!